Patrick Mahomes (Texas Tech at Kansas) is the most underrated quarterback in the country in our eyes, being deadly through the air (377 yards and 3.17 touchdowns per game) and on the ground (34.17 yards and one touchdown per game) this season. He’s going up against a very bad Kansas defense that is ranked 92nd in passing S&P+ and just gave up 246 yards and four total touchdowns to Seth Russell on 32 touches. Mahomes is averaging 48.5 touches per game, making him quite simply the best quarterback on the board for the early slate. Joe Hubener (Kansas State vs Oklahoma) is coming off a surprising game against TCU in which he ran for over 100 yards and four touchdowns. In this game against Oklahoma, we expect some of that play making ability on the ground to shine. Oklahoma has a great defense according to all S&P measures, but they did just struggle against Texas and their mobile quarterback, Jerrod Heard. Heard pulled off a 21/115/0 performance in a close win last weekend. Hubener’s potential is big because of his goal line usage, but the lower total for Kansas State this weekend (26) somewhat limits his upside. Therefore, we consider him a great option in cash games and one that will provide you with salary relief. Chad Kelly (Ole Miss vs Memphis) can be a little volatile, but his bad games have mainly come against his toughest matchups (Florida/Vanderbilt). If you’ve been watching mid-week football then you’ve seen how great this matchup is for Kelly and Ole Miss. Memphis’ defensive rankings include a 102nd ranked passing S&P+ and 107th IsoPPP+. This Ole Miss offense is among the best in big plays, ranking eighth in 30-plus yard plays this season. Kelly is a high usage player (31.33 pass attempts/6 rushing attempts per game) with a very affordable price tag on DraftKings and DraftDay. Additional notes: Seth Russell (Baylor vs West Virginia) is a great option this weekend, but his high price and difficult matchup makes him a secondary play in this price range. Russell faces the 17th ranked passing S&P+ and 8th ranked IsoPPP+ defense (West Virginia) on Saturday. Baylor’s offense is built on big plays, limiting his upside. Dane Evans (Tulsa at ECU) is a good tournament option at the position because of the tempo of the Golden Hurricane offense. It provides plenty of attempts for Evans, which in turn, provides him with a very nice floor. He’s averaging 40 passing attempts and 367.8 passing yards per game this season. On DraftKings he has the best value because of the passing yardage bonus, something he has attained in every game this season. The ECU defense is struggling to stop the pass in 2015 (80th in passing S&P+), but will see their starting cornerbacks return for this game. Brenden Motley (Virginia Tech at Miami) is listed as a co-starter for Saturday’s game pending Michael Brewer’s (Virginia Tech at Miami) availability. If he starts, then he’s a great tournament option, providing plenty of salary relief on DraftKings and Fantasy Aces. Even though his usage has been low (32.5 touches per game), he has been very effective when starting (21.66 DraftKings Fantasy points per game). This is because of his 66% market share of touchdowns in his five starts. Thomas Woodson (Akron at BGSU) reminds us a lot of Motley in his usage and quarterback ability. He’s a lower percentage passer (51.8%) with a big frame (6’1, 240) that can be used in the running game. He’s averaging almost 11 carries per game in his last four, which is a lot more appealing than his 27.25 passes per game. His matchup pushes him to the top, as BGSU plays an up-tempo style of football and their defense has struggled so far in 2015 (91st in passing S&P+). James Summers (ECU vs Tulsa) is the elite tournament option of this group of quarterbacks. His $4,500 price tag on FanDuel is hard to ignore and warrants at least a little bit of attention heading into his game against Tulsa. There’s a chance he starts the game, but doesn’t finish and vice versa. Playing against a team like Tulsa is very appealing. If Summers can run for 169 yards and combine for a total of three touchdowns against Virginia Tech, then there’s no telling what he can do against Tulsa if given the opportunity. We’ll monitor this situation closely and let you know his status for the game in the live alerts on Saturday. He has scored a touchdown in 10 straight games. He has three touchdown upside and has done so twice in 2015. He averages 21 touches per game. Put all of those factors together and you have yourself a player with a high floor (24.4 DraftKings Fantasy points per game in 2015) with high upside for his price tag (38.9 DraftKings Fantasy points against Wisconsin on 17 touches). We’ve certainly never been on the Ralph Webb (Vandy at South Carolina) bandwagon, but it’s about time to jump on board. While he’s not an explosive player (4.0 yards per carry in 2015), his usage per game (25) and matchup (102nd ranked rushing S&P+) provides a high floor foundation for a mid-range priced running back. He even provides a little bit of upside because of his usage in the passing game (three catches per game, two touchdown catches). Webb should be an option in all formats on FanDuel and DraftKings. Jordan Canzeri (Iowa at Northwestern) had many contextual factors in his favor last week and he produced big time against Illinois (43/256/1, 2/15/1). The injuries to the second string running back and top receiver really put the offense in Canzeri’s hands. This week against Northwestern, he’ll face the 39th ranked rushing S&P+ defense this season, but he continues to have contextual factors in his favor. Adding the Iowa quarterback, C.J. Beathard, to the banged up list (hip) with a great game script (Iowa -2) and there’s a lot to like about Hawkeyes’ back. With Canzeri’s usage potential being in the 40s, it’s very hard not to utilize him in all formats. Dare Ogunbowale (Wisconsin vs Purdue) benefited from Taiwan Deal being injured last week, rushing for 117 yards on 18 carries in the starting role. This week he’ll face a bad run defense (113th ranked rushing S&P+) as the starting running back. In a game where Wisconsin is a 24-point favorite (36.5 team total), it’s very tough to think Ogunbowale won’t see 15-20 touches and at least one touchdown. We prefer Webb over Ogunbowale on FanDuel, where he’s significantly cheaper, but Ogunbowale gets the nod on DraftKings. Additional notes: Dalvin Cook (FSU vs Boston College) has taken a back seat to Leonard Fournette as the top running back in college football, but don’t be fooled – Cook is the real deal. He’s averaging nine yards per carry and just under two touchdowns per game this season. Cook showed that his minor injury in the Wake Forest game was not an issue, rushing for 22/222/2 in the Miami (FL) game last weekend. He’s facing a top 25 run defense, but his ability to break the long one will always keep him in the picture as a great tournament play. Zack Langer (Tulsa at ECU) has benefitted immensely by Dane Evans ability to get the ball down the field this season. Langer has 10 touchdowns, but is only averaging 3.9 yards per carry on 27 carries per game. Shock Linwood (Baylor vs West Virginia) could see a bigger role in this offense because of how difficult the matchup is for Russell and the passing game. Considering he has been dynamic with his limited touches in 2015 (9.6 yards per carry), any sort of uptick in his usage makes him to be a top option each and every week. Consider Linwood a great pivot option from Derrick Henry. Gerald Wicks/Keith Harrington (Washington State vs Oregon State) are two great low priced options on DraftKings and DraftDay because they are PPR sites. It’s not often that we suggest Washington State running backs, in fact we don’t believe it’s something we’ve ever done. This weekend though, the salary relief they provide you with in cash games and the depth at the receiver position make them smart plays. Wicks has caught 16 passes in the last four outings, while Harrington has caught 17 passes. Wicks is our favorite between the two because he’s averaging eight carries per game compared to Harrington’s 3.5. Jakeem Grant (Texas Tech at Kansas) is having one heck of a season, averaging 7.33 catches, 108 yards, and .66 touchdowns per game. Grant even has a touchdown pass this season. Against Kansas, nothing should get in his way; the Jayhawks rank in the 90s in passing S&P+ and IsoPPP+ in 2015. He has picked it up in Big 12 play, averaging eight targets per game against non-conference opponents compared to 12 targets per game against Iowa State and TCU. Grant is the clear number one target in this offense, averaging 2.8 targets more than Reginald Davis, the number two target this season. Laquon Treadwell (Ole Miss vs Memphis) has an extremely attractive price tag on DraftKings and a more than affordable price on FanDuel. Like Grant, he’s an elite option on all sites. Treadwell’s matchup is one of the best on the slate. Memphis’ defense has been terrible, giving up big games to three different Cincinnati receivers as well as Roger Lewis. Treadwell is widely considered as a top three receiver prospect with good reason. This 6’2, 210 specimen has 63 targets in six games this season! If you want to take advantage of the Memphis defense, Treadwell is the clear route for doing so, as he’s the top target for Kelly by 37 targets (Cody Core – 26 targets). Calvin Ridley’s (Alabama at Texas A&M) price on FanDuel blows us away. He’s minimally priced after 14 catches, 260 yards, and two touchdowns in his last two games – clearly there’s a pricing error. We have seen a huge shift in Ridley’s targets since his first two games. In those first two games, Ridley was targeted just 11 times. In the four games since, he has been targeted 47 times. While Texas A&M’s passing defense has been stellar thus far (5th ranked passing S&P+), it’s tough to pass on a minimum priced receiver like Ridley. 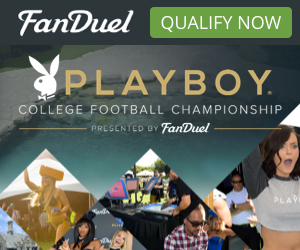 Consider him a plug and play option on all DFS sites, especially FanDuel and DraftDay. Isaiah Jones/Trevon Brown (ECU vs Tulsa) are the top options in the East Carolina passing game and have not been affected by the switching of quarterbacks. In fact, the two have caught five touchdowns passes in the last three games. Blake Kemp, the pro-style quarterback, and James Summers, the dual-threat quarterback, have been very effective in their appearances, but there is no clear starter as of this time for the Pirates. Tulsa’s defense ranks in the bottom 30 in every S&P+ and IsoPPP+ category making these two receiving options very safe selections. Elevate these two plays even more if Kemp draws the start against Tulsa. Additional notes: Corey Coleman (Baylor vs West Virginia) has been essentially automatic each and every week, averaging 31-plus DraftKings Fantasy points in every game this season. This weekend, he faces his toughest matchup against West Virginia, which combined with his salary, are the only reasons why he’s listed here. Will Coleman put up great numbers? Yes! But, the issue with rostering Coleman this weekend is his his limited upside compared to weekend’s past. He’s finally over $8,000 on DraftKings, which is too expensive for our taste to make him a top play. Keyarris Garrett/Josh Atkinson (Tulsa at ECU) have become the top two options after Keevan Lucas injured his knee a few weeks ago. Garrett is the clear number one and has been targeted an unimaginable number of times in his last three games (55 times!). Atkinson has been targeted 39 times in the last three games, which is also a high number for someone priced in the mid-range of receiving options this weekend. Obviously Garrett is our favorite of the two options, but if you need salary relief, then Atkinson is more than usable against an ECU pass defense that ranks 80th in passing S&P+ this season. Tajae Sharpe (UMass vs Kent State) is a man amongst boys in this game we call football. He is only available on one site, which is why he’s located here in the additional notes section, but is still an elite option over at FanDuel. His 18.2 target per game average is the best in college football by 2.8 targets! While Sharpe does face a top 40 passing S&P+ defense, his usage makes him matchup proof. Trent Taylor (Louisiana Tech at Mississippi State) saw a major increase in targets from his previous two games because of the Paul Turner and Kenneth Dixon injuries. Against UTSA, he saw 15 targets, which was a significant amount higher than his 19 targets in the previous two games combined. Both seem to be back for the game against Mississippi State, but we’re not quick to abandon Taylor just yet. While Mississippi State has a top 40 passing defense, Louisiana Tech is going to be playing from behind all game and Taylor is their short route threat. The game script is favorable to the passing game in this offense, making Taylor a great tournament option this weekend. 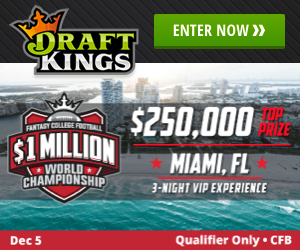 Focus your attention on him in tournaments at DraftKings where they have PPR scoring. Jerminic Smith (Iowa at Northwestern) is in an odd place this weekend. He’s coming off a 10-target game and should continue to be a top target in the offense, but the Iowa quarterback, C.J. Beathard is banged up with a hip injury. The freshman had a breakout game in his first real action last weekend, catching four passes for 118 yards against Illinois. He’s near minimum priced on every site this Saturday, making him a great large entry field tournament option. Troy Fumagalli (Wisconsin vs Purdue) has been very relevant for the past two weeks, catching nine total passes for 82 yards and one touchdown. He’s our top play at the position because of the weaker matchup against Purdue and because of his increase in targets. His price tag on DraftDay and Fantasy Aces are very appealing. George Kittle (Iowa at Northwestern) is the cheapest we’ll go this week, after seeing some great athleticism out of him against Illinois last weekend. His targets are limited (four targets in his last two games), but he has a touchdown in three straight games and was just inches away from a second touchdown last weekend. Additional notes: Rodney Mills (UMass vs Kent State) is only available on FanDuel, but we consider him the top option on that site. In his first game back from injury, Mills saw 11 targets. You can’t go wrong with an option like Mills in any format this Saturday.